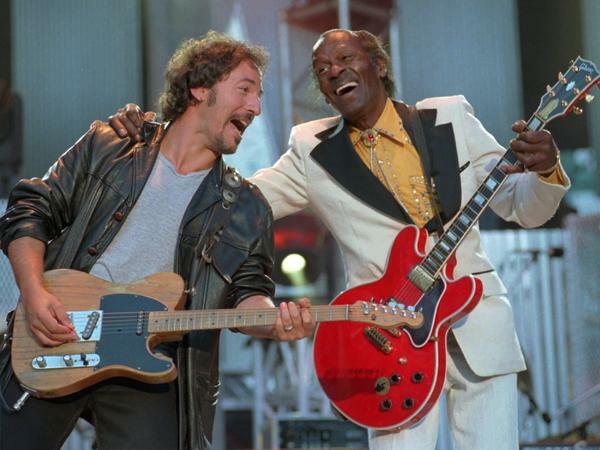 In this Sept. 2, 1995 file photo, Bruce Springsteen, left , and Chuck Berry laugh as they perform the Berry hit "Johnny B. Goode" at the Concert for the Rock and Roll Hall of Fame in Cleveland. Berry was the opening act of the concert. Rolling Stones frontman Mick Jagger wrote that he was "so sad" to hear of Berry's passing. "I want to thank him for all the inspirational music he gave to us. He lit up our teenage years, and blew life into our dreams of being musicians and performers. His lyrics shone above others and threw a strange light on the American dream. Chuck, you were amazing, and your music is engraved inside us forever." Jagger's bandmate Keith Richards chimed in. "One of my big lights has gone out," he tweeted. Beatles drummer Ringo Starr tweeted lyrics from one of Berry's biggest hits, "Rock And Roll Music." "Just let me hear some of that rock 'n' roll music any old way you use it I am playing I'm talking about you. God bless Chuck Berry," tweeted Starr. Beach Boy Brian Wilson tweeted his appreciation. "I am so sad to hear about Chuck Berry passing - a big inspiration! He will be missed by everyone who loves Rock 'n Roll. Love & Mercy". Back in 1963, Berry's lawyers contended that the Beach Boys' hit "Surfin' USA" ripped off Berry's "Sweet Little Sixteen." Wilson's father and the band's manager, Murry Wilson, signed over the song's publishing rights to Berry's publisher. The Los Angeles Times notes that Wilson regularly plays Berry's songs in his live shows, even weaving "Sweet Little Sixteen" into "Surfin' USA." Questlove, drummer and bandleader of The Roots, had a simple message for people trying to discuss Berry's legacy, tweeting "he literally was THE STANDARD for rock n roll." Bruce Springsteen also tweeted what Berry meant to him. "Chuck Berry was rock's greatest practitioner, guitarist, and the greatest pure rock 'n' roll writer who ever lived," he wrote. "This is a tremendous loss of a giant for the ages." Springsteen and Berry played together on at least two occasions. The Boss and his E Street Band played backup for Berry at the University of Maryland in 1973. Springsteen asked what songs they were going to do, to which Berry replied, "Well, we're going to do some Chuck Berry songs." More than two decades later, Springsteen again played backup for Berry, at a concert at Cleveland Municipal Stadium, celebrating the opening of the Rock and Roll Music Hall of Fame. Berry was inducted into the hall in 1986 its first class, alongside musicians including Fats Domino, Elvis Presley, and Sam Cooke. Springsteen's grin says it all, as Berry leads the 57,000-person crowd in yelling "Go!" before shimmying his one-legged duck walk across the stage. It was a show for the ages.